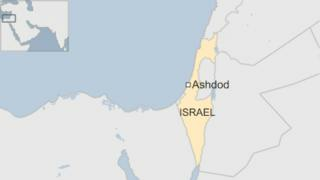 An umpire at a cricket match in the Israeli city of Ashdod has died after being hit by a ball. A batsman's shot struck Hillel Oscar in the neck, possibly after a ricochet from the stumps at his end of the pitch. The incident comes just two days after Australian batsman Phillip Hughes died of a head injury caused by being struck by a ball at a match in Sydney. Umpires in cricket, unlike some players, do not wear helmets. However, such incidents are extremely rare. An umpire at a match in Wales died five years ago after a ball thrown by a fielder hit him on the head. Mr Oscar was the former captain of the Israeli national cricket team. He was taken to a city hospital, but medics were unable to revive him. Correspondents say cricket is not a popular sport in Israel, though there is an amateur league largely populated by players from countries such as India, South Africa, Australia and New Zealand. The incident took place amid sorrow and shock in the cricketing world. On Thursday, Australian Test cricketer Hughes died of his injuries, two days after being struck on the neck by a bouncer in an Australian league game. His funeral is due to be held on Wednesday. Phil Hughes: Could head injuries be eliminated? Phillip Hughes: How does cricket move on from batsman's death?